Blueberry Balsamic Pork Chops - a different kind of sweet & sour pork! Blueberry Balsamic Pork Chops. Simple seared or grilled chops with a savoury, sweet and sour sauce that compliments the pork beautifully. These blueberry balsamic pork chops are one of our family favourite recipes for a quick weekday supper. 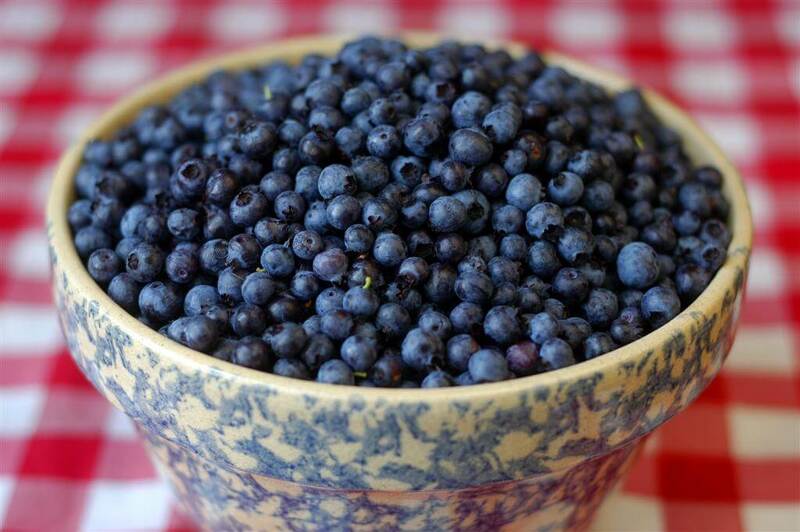 Nothing beats good old wild Newfoundland blueberries in this recipe. Mine come courtesy of my father in law, Len, who more than makes up for my lack of enthusiasm for berry picking with a steady supply to my freezer. Though many people have written that they were skeptical about blueberries and pork, I’d used them successfully in the past in a gorgeous recipe for Blueberry Plum Chutney. That went particularly deliciously with pork chops so I had no worries at all about developing a more sweet and sour version of a pan sauce for this versatile meat. Most of those same skeptics became quick converts after trying this easy 30 minute meal. 2017 update: This recipe has continued to be one of our most popular pork chop recipes since first posting it back in 2008. It has become a fan favourite and a regular meal on meal plans of our followers. 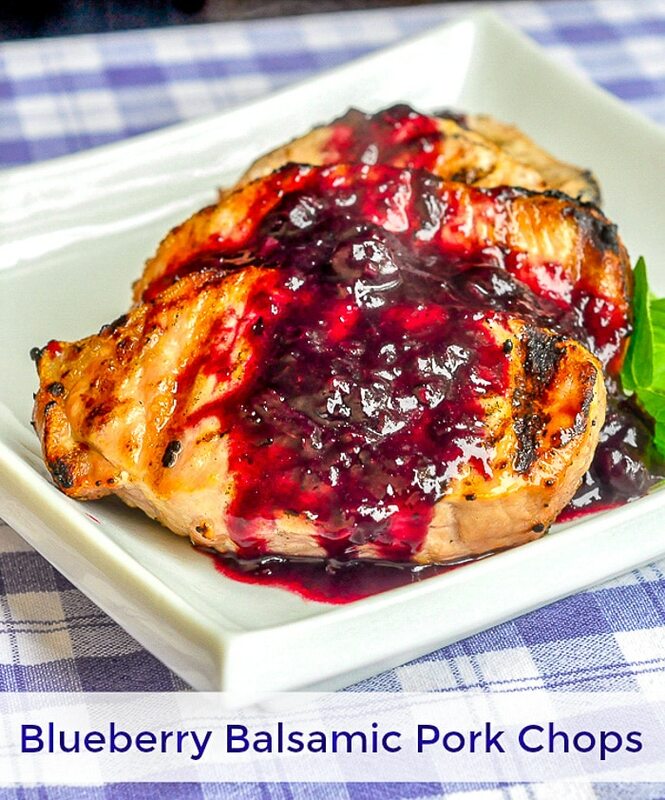 Like this Blueberry Balsamic Pork Chops recipe? 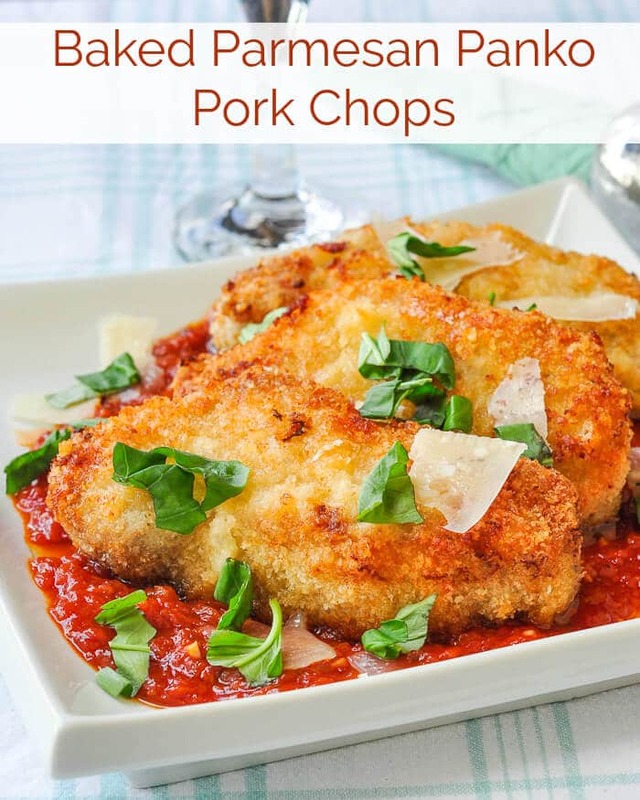 Find plenty of other recipes like this, especially amazing pork chop recipes like our Double Crunch Honey Garlic Pork Chops in our Pork Recipes Category. For another very popular pork chop idea, check out our Baked Parmesan Panko Pork Chops. Blueberry Balsamic Pork Chops - simple seared or grilled chops with an easy to prepare, sweet and sour pan sauce that compliments the pork beautifully. Pan fry the pork chops in the olive oil and garlic until completely cooked about 4-5 minutes per side. (or grill them on a gas or charcoal grill) Hold the pork chops in a warm oven. Add the blueberries, balsamic vinegar, wine (or stock), thyme, nutmeg and brown sugar and honey. Simmer to reduce the volume of the sauce by half. Add the lemon juice and butter and simmer for an additional minute or so until the sauce slightly thickens. Season with salt and pepper to taste and spoon the sauce over the cooked pork chops. If your blueberries are particularly juicy and especially when using frozen berries, you can thicken the sauce slightly if necessary by adding a slurry at the end made by dissolving together 1 tsp corn starch and 1 ounce cold water. When using grilled pork chops instead of pan-fried just begin the sauce by lightly sauteing the garlic, then add the other ingredients as directed. Absoutely the best pork chops I have ever eaten. My family loved it, and it was very fast. From start to finish it was 25 minutes. This recipe was fantastic. It will become a staple in my house. 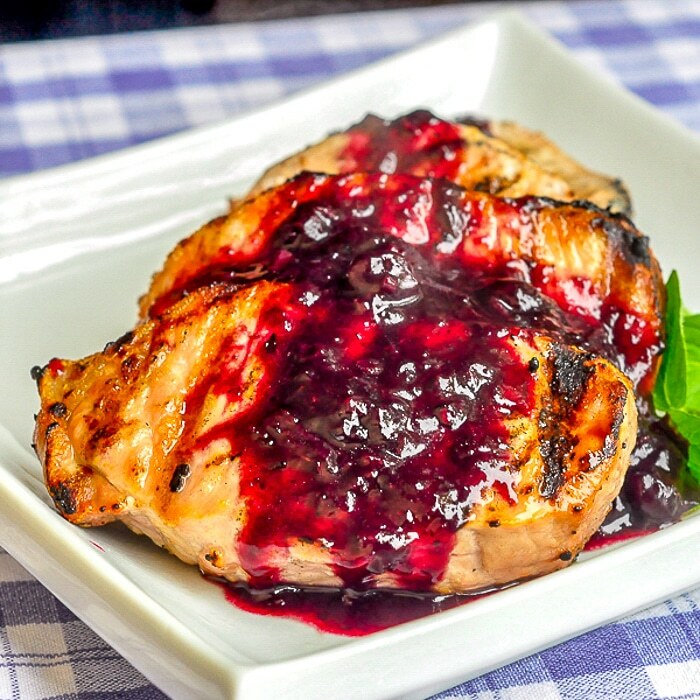 The blueberry sauce can be used with a variety of meats, as well as a salad dressing. I left out the butter, but it was still great. Glad you liked it. It is already a staple at our house. I do a similar thing with partridgeberries and orange for chicken or turkey breasts. Must remember to add that to my to-do list as well. I picked a ton of fresh blueberries at a friend’s house last weekend so I’ve been searching for new ways to use them (pancakes & muffins are tired)…Foiund this and made it and LOVED it…Quick, easy & delicious…Thanks for posting it! PS…I served these with a salad dressed with blue cheese dressing (blueberries & blue cheese go very well together) & a chilled pinot grigio…yum! My husband typically hates porkchops, but he LOVED this recipe! I was making baked zucchini fries to go with it and had extra panko breading, so I coated the chops too. Turned out very well. I just LOVE this recipe and so does my family!!! It paired wonderful with oven roasted potatoes and quinoa and salad. Glad they were such a success.It’s been too long since I had these chops…they are going on this weeks menu for sure…just love ’em. This was one of the easiest and most delicious meals I have ever made!! I live near The Culinary Institute of America and this is worthy enough to be served in one of their restaurants. I truly can’t wait to make this again! Follow the recipe with no changes. I want to make this for a dinner party but I wonder if the blueberry sauce can be made ahead of time? No because the sauce starts with the pan drippings from the pork chops. This sauce was absolutely delicious! I made salad and parsnip “fries” along side and the sauce was super yummy with those as well! Oh, and I want to eat the sauce for dessert too.